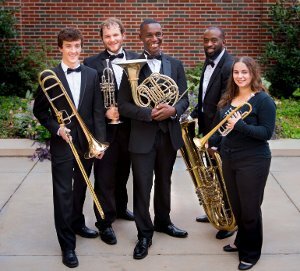 The Blackwelder Brass is the top graduate brass quintet at the Wanda L. Bass School of music at Oklahoma City University. The group was founded in 2004 with the arrival of Professor Michael Anderson, a member of the Oklahoma City Philharmonic and OCU’s director of brass studies. The group performs more than 50 times a year, exploring a varied and imaginative repertoire in recitals, sacred music, and formal ceremonies. Members also are featured soloists in several larger ensembles. 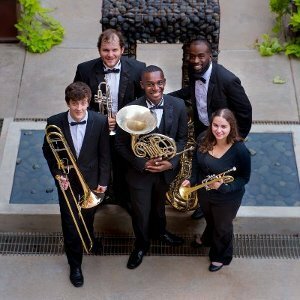 The members of the Blackwelder Brass are graduate assistants in the school of music and are awarded a full tuition waiver as well as a stipend. The students in this group receive significant professional playing experience through a paid residency program at three of Oklahoma City’s most prestigious churches. The Wanda L. Bass School of Music at Oklahoma City University is renowned for its exceptional training of musicians in the liberal arts tradition. For 80 years, its graduates have been in demand as singers, conductors, composers, instrumentalists, educators, critics and commentators. School of Music alumni include an Ellsworth Smith International Solo Trumpet Competitions winner, International Trumpet Guild Solo and Orchestra Competitions winners, and alumni who have won positions in full time orchestras and military bands. The Wanda L. Bass Music Center, a $31.5 million, 117,000-square-foot addition more than doubles the size of the Bass School of Music. The Bass Music Center features 60 additional practice rooms, 40 new teaching studios, seven high-tech music labs, six ensemble rehearsal rooms, and a black-box theater. The expansion incorporates new advances in sound isolation and acoustical breakthroughs.